Mature microRNAs (miRNAs) are small-sized RNAs cleaved from precursor microRNAs (pre-miRNAs) by the RNase Dicer. Various miRNAs play key regulatory roles in tumorigenesis and metastasis, and are therefore potential diagnostic and prognostic cancer biomarkers. However, detecting miRNAs and pre-miRNAs accurately and selectively in living cells remains a major challenge, as the mature miRNA sequence is also present in its pre-miRNA and current sequence probes exhibit poor gene delivery efficiency. Herein, we report a strategy for selectively and accurately detecting miRNA-21 and pre-miRNA-21 in living cells using functional MoS2 nanosheets (NSs) loaded with rationally engineered molecular beacons (MBs). 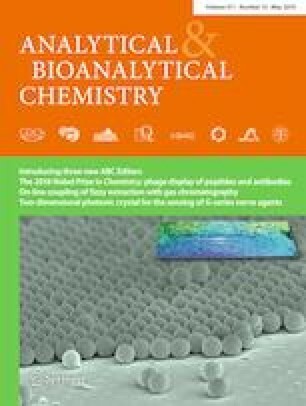 The exfoliated MoS2 nanosheets (NSs) with a mean lateral diameter of 50–70 nm were functionalized with the aptamer AS1411 and polyethylene glycol (MoS2-PEG-AS) to achieve target-cell-specific delivery and to enhance biocompatibility. The large available surface of the MoS2-PEG-AS was loaded with MB probes. The resulting MoS2-PEG-AS/MBs present cancer-cell-targeting ability, good protection properties, good optical stability, and biocompatibility. We demonstrated that the resulting nanoprobes can selectively image miRNA-21 and pre-miRNA-21 in various cell lines by facilitating enhanced fluorescence in the presence of miRNA-21 and pre-miRNA-21. Thus, these MoS2-PEG-AS/MBs are potentially a tool to discriminate between intracellular miRNA and pre-miRNA at different expression levels. Fan Yang, Pei Liu and Xiangdan Meng contributed equally to this work. The online version of this article ( https://doi.org/10.1007/s00216-019-01753-x) contains supplementary material, which is available to authorized users. The work was supported by the Major Program of the National Natural Science Foundation of China (21890742); the National Natural Science Foundation of China (21874008, 21475008); the Special Foundation for State Major Research Program of China (grant nos. 2016YFC0106602 and 2016YFC0106601); the Open Research Fund Program of the Beijing Key Lab of Plant Resource Research and Development, Beijing Technology and Business University (PRRD-2016-YB2); the Fundamental Research Funds for the Central Universities (grant no. FRF-BD-17-016A); and the Beijing Municipal Science and Technology Commission (grant no. z131102002813058). The MCF-7 cells (human breast cancer cells), HeLa cells (human cervical carcinoma cells), and NHDF cells (normal human dermal fibroblasts) were obtained from Beijing Dingguo Changsheng Biotechnology Co., Ltd. (Beijing, China). The animal experiments were approved by the Institutional Animal Care and Use Committee of the Beijing institute of Basic Medical Science (Beijing, Chain). The animal experiment was conducted in compliance with the National Regulation of China for the Care and Use of Laboratory Animals. Fan Yang and Pei Liu received research grants from the Beijing Advanced Innovation Center for Food Nutrition and Human Health, Beijing Technology and Business University. The authors declare that they have no conflict of interest.